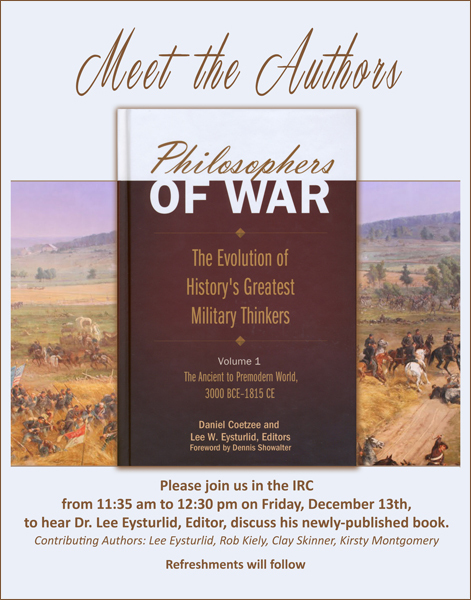 Following on the heels of Eric Smith’s successful book launch at the end of October, another book launch will be held in the IRC on Friday, December 13, 2013 from 11:35 a.m. until 12:30 p.m.
Lee Eysturlid, Ph. D., will discuss the newly published books, “Philosphers of War: The Evolution of History’s Greatest Military Thinkers, Volume 1 and 2.” Eysturlid is the editor as well as one of the contributing authors, along with fellow IMSA history faculty, Rob Kiely, Clay Skinner and Kirsty Montgomery. All the authors are expected to attend and there will be a question and answer period after the presentation about the book. Refreshments will be served. This entry was posted in Programs on December 9, 2013 by nluebke. The eighth annual IMSA Community Family Reading Night was coordinated and hosted by IMSA’s Information Resource Center and student volunteers for area elementary school students and their families on November 14, 2013. This year’s theme was “Reading Robots,” and during the two hour event, elementary students and their siblings painted ceramic robot banks and participated in an IMSA’s Kid’s Institute science activity. 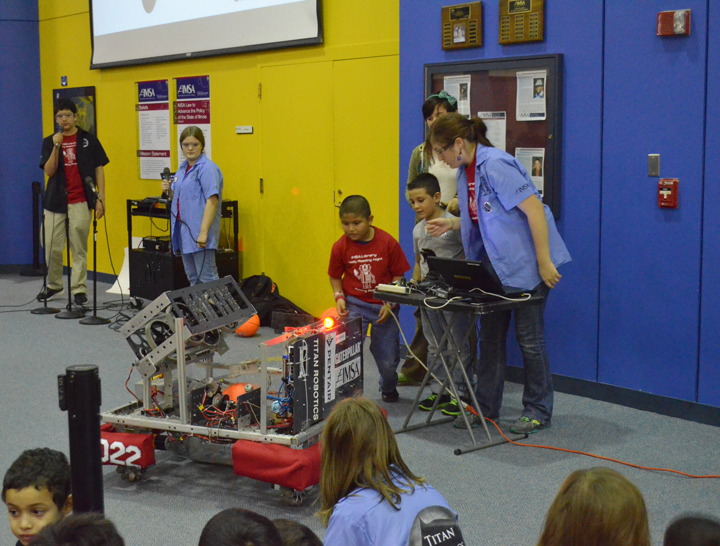 The IMSA Robotics Team presented a demonstration of a robot they had built, and many of the attendees were able to use the remote control to “drive” the robot. Approximately three hundred students, siblings and their parents from area Aurora elementary schools attended. Participating schools included Oak Park Elementary School, McCleery Elementary School, Smith Elementary School and Hall Elementary School, all from Aurora; and Fearn Elementary School from North Aurora. In addition to crafts time, face painting, the science activity and the robotics, there was Storytime in the IRC. Each child who attended was given a free book provided by the Literacy Program of the Junior League of DuPage and Kane Counties . The IMSA Office of Admissions coordinated student-led bilingual tours of the IMSA campus for parents. This year Dart Container was the event sponsor, and their generous donation allowed for every child in attendance to leave with a t-shirt/backpack. Another sponsor of Family Reading Night was Oberweis Dairy, which provided free ice cream to all in attendance. Raffle prizes were donated by East and West Aurora High School Athletic Departments, Pizza Hut and Luigi’s Pizza and Fun Center. This entry was posted in Programs on December 2, 2013 by nluebke. What began as a dissertation, evolved into a book after ten years of work. Eric Smith, Ph.D. has written his first book and the IRC held a book party to celebrate the occasion on Friday, November 1, 2013. Students, staff and department colleagues attended the event, along with Smith’s special guests, Bruce Thomas, an educator from Hyde Park, and Ph.D. advisor, Richard Fried, Ph. D., professor emeritus at University of Illinois, Chicago. 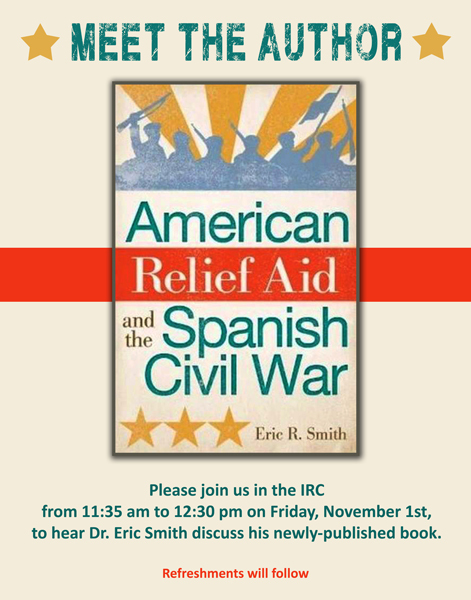 Smith’s book, “American Relief Aid and the Spanish Civil War,” focuses on the Spanish Civil War. “The background for my research is Spain’s Civil War from 1936-1939, which brought out the worst elements in Europe. It is a topic with about as much argument among historians as there were arguments among the various parties of the time. Writing a book on the topic is a test of academic discipline because it takes restraint to not attack all of the various arguments and interpretations about the events,” said Smith. During the hour long book party, there were opening remarks from Dan Gleason, an introduction from Lee Eysturlid , and a certificate from IMSA principal Branson Lawrence recognizing Smith’s achievement. During his presentation, Eric Smith delved into the Spanish Civil War, touched on the Catholic Church’s and America’s part in the war, explained some of his research process and answered questions. “American Relief Aid and the Spanish Civil War” is available for checkout from the IRC. This entry was posted in Displays, Programs on November 5, 2013 by nluebke. The 7th annual IMSA Community Family Reading Night for area elementary school students and their families will be held on November 15, 2012 from 6:00 p.m. until 8:00 p.m. This year’s theme is “The Sports of Physics,” and local athlete Kenny Battle will be making an appearance. 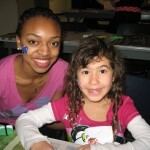 As many as 200 children from six Aurora area grade schools and their family members are expected to attend the Family Reading Night event, which has been coordinated by the Information Resource Center and IMSA student volunteers. During the fun-filled and educational evening, the young students and their families will watch performances by IMSA student groups, listen to storytelling by IMSA staff, design and make sports related crafts, and participate in hands-on science activities led by the Kids Institute. There will also be student-led bilingual tours of the IMSA campus during the evening. This entry was posted in Programs on November 5, 2012 by jean.